Ooty is the famous hill station of Tamil Nadu, and it’s another name is Udhagamandalam. This Nilgiri hill place is a sheer beauty and pleasure place of the South India. The natural beauty of the spot is capable of make the moment memorable. The plush tea gardens, lined streets, falling orchards, green pine and trees of eucalyptus with multi-coloured floral offers this place as first choice for a nature lover. Toy train of Ooty is special as lots of songs and movies being made on this train. Botanical Garden: This is the famous the park which is spread in 55-acre land area. This garden is situated at Dodabetta hill, and it is the top peak point of Ooty founded by John Sullivan. John was the collector from Coimbatore and also a discoverer of Ooty for summer season. Here tourist will be able to enjoy watching diverse flora, which includes 30 varieties of eucalyptus, and colourful avian city. Special events conducted in the summer season could be different experience for a tourist. The Summer Festival is performed every year in May. Tourist can enjoy events such as flower shows, cultural programs, dog-shows and trekking sports. Museum: this museum is situated on Mysore Road. It contains a wide collection of tribal arts and crafts through which tourist can learn about the history of this place. Educating tourist through available sources about the Nilgiri purlieu is the major concern of this museum. Its timings are 10 am to 5pm, and it is closed on every Friday, second Saturday and on national holidays. St. Stephens Church: this is another spot, which is located on Club Road of Ooty. This church is designed with gothic-style. This oldest church of Nilgiri hills is the good place to visit. Ootacamund Club: This club is added into the list of best preserved colonial clubs in the country. Playing golf or selecting different activities in this club is diverse experience. Rose Garden: This is the park located at 3 km distance from Charring Cross. The area of park is about 10 acres and there are more than 2000 varieties of roses in the garden. Lake of Ooty: lake of Ooty is one more spot where a tourist can watch the natural beauty of the hill station. It is just 2.5 km far from the local bus stand, and its founder is John Sullivan. This lake is turned as the most beatific spot of tourist in Ooty. The mini-train helps the visitors to take a round of the park. Boating is another option in this park and tourist can enjoy the fishing with other events as well. However, tourist has to take prior permission for fishing from the concern department. NMR (Nilgiri Mountain Railway): this is the most amazing part of journey of Ooty. This World Heritage Site covers a good distance of 46 kms through various Nilgiri Hills. There are 208 curves, 250 bridges and 16 tunnels throughout the journey. This journey starts from Mettupalayum, which is 1069 ft higher. 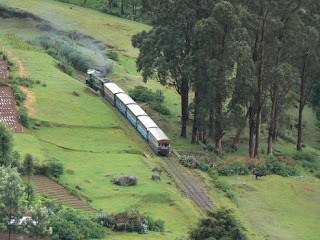 The train takes approximately 290 minutes to reach Ooty, which is situated at the good height of 7,440 ft. Adventure escapades: those people who love, hang-Gliding, Trekking and Angling kind of activities can reach the Ooty adventure escapades to enjoy some amazing sports. Coonoor: just, 10 kms away from Ooty where people can enjoy Dolphin’s Nose Viewpoint, and many other things such as water falls and parks. Mudumalai Wildlife Sanctuary: this is another spot, which is just 67 kms from Ooty bus stand. It is one of the largest populated areas of elephants in India. The wild dogs, Nilgiri langur (monkey), gaur (Indian bison), jackal, bonnet macaque, hyena and sloth bear are some big animals that visitors can watch in this sanctuary. Avalanche: next-best spot near Ooty is an avalanche which is just 26 kms away from the city. Here people can do the fishing and some more water sports though, summer is the best season to visit this place. Some more places like Mukurti (36 km), Pykara (21 km), Kalhatty Falls (12 kms) are other places for visitors. By Air: nearest airport to reach Ooty is Coimbatore. The journey between Coimbatore and Ooty is 3 hours 30 minutes. Frequent flights are available from various parts of the country to reach Coimbatore. By Train: The Nilgiris Express is directly connected from Chennai to Mettupalayam. Mettupalayam is the closest railway station to reach Ooty. This small town is situated at foothills of the Nilgiri Mountain. The train commences at 6.30 am so visitors should plan their trip accordingly. From Mettupalayam, the Toy Train is available to reach Ooty. This toy train moves twice a day so tourist can reach the spot accordingly. However, passenger capacity is less of this toy train so first come first serve is the procedure to get the train. By Car: the beautiful hills and their amazing view from the car could be different experience for a tourist. The Blue Mountains known as Nilgiri’s are full of natural beauties and deep valleys. The heavily forest winding roads and sharp bends give diverse feeling. By public transport: Buses from different parts are reaching directly to Ooty so visitors can go through deluxe or comfort buses. Selection is based tourist comfort as there are lots of public transport vehicles are available. Coimbatore is just 89 Kms away, Mysore is 160 Kms, Bangalore is 290 Kms, Calicut is 187 Kms, Cochin is 281 Kms, Kodaikanal is 256 kms, Trichy is 302 Kms away from Ooty.